I was wondering if it was possible to make butter from milk rather than cream. Everything I read online indicates that it must be cream and can't be done with milk, and that the only way is to get raw cows milk straight from the cow so to speak, skim the cream off the top and go through the process with the cream. 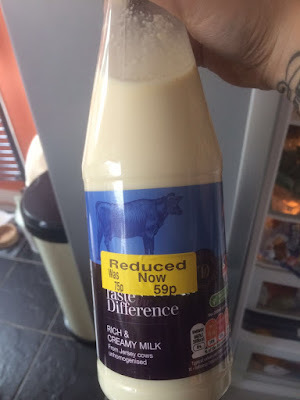 Since I rarely listen to what I'm told I convinced myself that it would be possible to use the unhomogenised gold top to make butter, so when Fast-Momma picked a bottle up reduced it was fate that I'd get to experiment and see what would happen. So I poured out a couple of amazing creamy cups of tea to give the milk space to shake about and began the process. 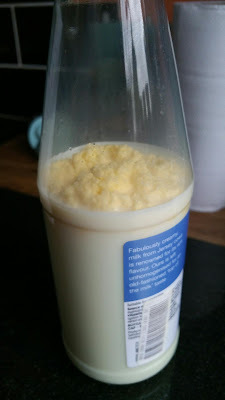 it does take a little bit more time than double cream, granted, but after 15-20 minutes of shaking I started to see that familiar "scrambled egg" form in the bottle. sieve the solids out, press out the remaining buttermilk and sit in the fridge to set it if you prefer it hard, hey presto you have butter. So there you have it, milk in to butter. Good for you for not taking "their" word for it, (whoever "they" are LOL). I think most folks assume all milk is homogenized, so of course no butter. You demonstrate how it pays to pay attention to the product and see for yourself.